We’d love your help. Let us know what’s wrong with this preview of The Inaugural Meeting of the Fairvale Ladies Book Club by Sophie Green. To ask other readers questions about The Inaugural Meeting of the Fairvale Ladies Book Club, please sign up. It was 1978 and Fairvale Station had been in the Baxter family for generations. Now Sybil and Joe ran and cared deeply for the property and had raised two children - Lachlan and Ben – but Lachie wasn’t interested in inheriting the station. He wasn’t interested in anything to do with his family or the Territory – when he left without a word, Sybil and Joe were shocked and saddened. But Ben loved the property and was happy to help his father run it until such time as he took over the reins. Ben ha It was 1978 and Fairvale Station had been in the Baxter family for generations. Now Sybil and Joe ran and cared deeply for the property and had raised two children - Lachlan and Ben – but Lachie wasn’t interested in inheriting the station. He wasn’t interested in anything to do with his family or the Territory – when he left without a word, Sybil and Joe were shocked and saddened. But Ben loved the property and was happy to help his father run it until such time as he took over the reins. Ben had been to London for a wedding, and whilst there had met Kate. They had immediately clicked and before long were married. When Kate joined Ben on Fairvale Station, she knew the adjustment to the vast difference in conditions might take some time to get used to. But she was a hard worker and happy to do her share. When Sybil decided to form a book club to introduce Kate to some people, it didn’t take long for her plan to fall into place. Her dearest friend Rita who was a Royal Flying Doctor nurse and based in Alice Springs would of course be a part of it. Della, who was a Texan girl and recently moved to Australia to work at the nearby Ghost River Station; and Sallyanne from Katherine, the mother to three young children and whose husband liked to drink too much, completed the group of women. The Inaugural Meeting of the Fairvale Ladies Book Club is the debut novel by Aussie author Sophie Green and it is absolutely brilliant in my opinion! The friendships between the five women shows how important it is, not just in the vastness of the Australian outback to have that contact, but everywhere; to be able to stave off loneliness and have a friend nearby if you’re in need of comfort. I loved the list of the year’s highlighted events at the beginning of each section indicating a new year. When I read through each item I’d suddenly realise just how long ago a particular event had happened. I also smiled with pleasure that the book club’s first book was Colleen McCullough’s The Thorn Birds. The Inaugural Meeting of the Fairvale Ladies Book Club is a delightfully refreshing novel which I thoroughly enjoyed, and highly recommend. This turned out to be not quite what I expected. Sure there was a Fairvale Ladies Book Club but it was pretty scarce. It seemed to meet about twice a year and consisted of five people so there needed to be a lot more than that to fill 384 pages! The rest was quite interesting. We followed the lives of several women living and working on stations or for the Flying Doctor service in the late 1970's and into the 1980's. There was some melodrama but also some realistic portrayal of the problems and d This turned out to be not quite what I expected. Sure there was a Fairvale Ladies Book Club but it was pretty scarce. It seemed to meet about twice a year and consisted of five people so there needed to be a lot more than that to fill 384 pages! The rest was quite interesting. We followed the lives of several women living and working on stations or for the Flying Doctor service in the late 1970's and into the 1980's. There was some melodrama but also some realistic portrayal of the problems and difficulties of the time. The characters were interesting and there were some tear jerking moments. Once I realised this was not going to be a book about books - despite the title - I enjoyed it anyway. it seemed a fair picture of life as it was for women in outback Australia at that time. Set in the Australian outback, starting in 1978, in a place called Fairvale, Sybil Baxter remembers all to well what it was like to arrive in such an isolated place all those years ago. When her son Ben brings home his British wife, Sybil needs to find a way to help her settle in and not feel alone. A book club springs to mind and will the help of her friend Rita the two get the club up and running. But the book club is more than just what is going on inside the pages, it is more about the friends, and their lives, both past and present. Upon starting to read The Inaugural Meeting of the Fairvale Ladies Book Club, I was surprised at how hard going I found it, and how slow the book was. If I’m being completely honest, three chapters in and I was all set for giving up. I put the book down and walked away from it. However, only a few days later I had the urge to pick it up again. This is a book that gets better the longer you read on. Not only did the plot progress into something so touching and meaningful, but the characters all develop and evolved as the pages turned and I found myself really getting involved in their lives. There is so much depth to this book. So many hard-hitting issues that the women have had to live through that they shared. This is a book that touched me, emotionally. It was a pure delight to be a part of the Fairvale Ladies Book Club. From the first meeting of the club in 1978, through to the close in 1981, it was a road travelled touched with both sadness and joy. Sophie Green’s latest fictional tale is a wonderful testament to the outback and to a band of women linked together by their love of a good yarn. In the far-reaching dusty outback plains of Fairvale station, near Katherine in the Territory, matriarch Sybil is looking for a way to surpass the isolation of her home and connect with other women. Sybil has a grand plan, to form a local book club. She enlists the help of her long time friend from nursing school Rita, who now works for the Royal Flying Doctors Service, out of Alice Springs. Sybil also invites her new daughter in law, Kate, who hails from Britain to join them. With Kate struggling to make the transition from life in a small English village to the expanse of the outback, the book club is the perfect vehicle for Kate to connect and make some new friends. Uniting the book club further is a lonely young mother of three Sallyanne and finally Della, a fearless Texan who has arrived to the local area in search of employment. Each of these five women face tests to their spirit in the years to come, as the ladies make their way through a varied collection of book club material. The Inaugural Meeting of the Fairvale Ladies Book Club is a tribute to the power of friendship in isolated outback communities. Books, friendship and the outback, what a perfect combination! I have to admit I was sold very early on with The Inaugural Meeting of the Fairvale Ladies Book Club. This is a book with an eye-catching title and a heart-warming story inside to match. It is a story I wouldn’t both hesitate to recommend to those who are part of a book club, have been in a book club in the past or are interested in the activities of a book club. This story will take you right inside an endearing book collective and leave you with a smile on your face, along with a whole new set of friends. I cherished the outback element of the sheer open space and the seclusion that goes with remote locales, such as Fairvale. Green competently expresses a strong sense of place in this novel. I felt every climate change and seasonal shift that occurred at Fairvale. In particular, the movement from the wet to the dry season was experienced to the fullest degree with the help of Green’s prose. This aspect of the book gave me a sturdy picture of the principal concerns of living in remote locations. I wholly appreciated the way in which this novel is carefully constructed. It is a gentle unravelling of the events that take place in five different women’s lives, of two generations, from the years 1978 through to 1981. The book takes its time to build a picture of each character that enters the novel and the narrative shifts between each of these five protagonists. In the end, the reader is given a complete overview of each woman’s triumphs, tragedies and defining moments. The narrative is evenly spread across the group and I came away feeling a strong sense of affection between each and every one of the Fairvale Ladies Book Club. The sense of place time period wise was a shining feature of this novel. Although I was born in the final year of the Fairvale Ladies Book Club, it was great to be reminded of the world events and trends that occurred in the late 1970’s and early 80’s. It was a nice touch to begin each new year with the Fairvale ladies with a rundown of the significant happenings the defined the year. It was a fun history lesson of sorts! Green manages to convey an ideal sense of nostalgia in her latest novel. By far, I relished the book components in The Inaugural Meeting of the Fairvale Ladies Book Club. The opening book that kick-starts the women’s togetherness, The Thorn Birds, was the perfect choice. This quintessential outback novel seemed to work to bond the women together through their shared experience of living and working in the outback. Following on from The Thorn Birds, Green incorporates a body of fine Australian literature, along with some children’s book greats and popular novels of the era in which this book is set. The book club list, kindly provided by the author at the back of the novel, encouraged me to seek out some new titles and re-read some classics. This is more the story of five women and their relationships rather than about a book club. But the book club is how it all started when Sybil who lives on a cattle station, Fairvale, near Katherine decides to find some companionship for her son Ben's young English wife Kate. She invites her good friend Rita, a nurse with the flying doctors, Sallyanne a young woman in town struggling with three young children and a difficult husband and Della, a Texan stockwoman on a neighbouring property, to th This is more the story of five women and their relationships rather than about a book club. But the book club is how it all started when Sybil who lives on a cattle station, Fairvale, near Katherine decides to find some companionship for her son Ben's young English wife Kate. She invites her good friend Rita, a nurse with the flying doctors, Sallyanne a young woman in town struggling with three young children and a difficult husband and Della, a Texan stockwoman on a neighbouring property, to the inaugural meeting of the Fairvale Ladies Book Club to be held twice per year at the start and end of the dry season. I have to start off by saying how much I loved this book. Its quite a chunky book to get through but so enjoyable you don't realise how fast you are turning the pages. Lots of dialogue in this read, which is what I love along with some narration which builds up the surroundings for the reader to focus on and imagine and relate to. Its based around the 1960's onwards to 1978 The North Territory had begun to self govern. Life had become hard and lots of people were isolated which made things very dif I have to start off by saying how much I loved this book. Its quite a chunky book to get through but so enjoyable you don't realise how fast you are turning the pages. Life had become hard and lots of people were isolated which made things very difficult for these women. She misses her son, very protective Mother, lovely warm woman. How is she going to fill her spare time? She is Sybil's daughter-in-law who is living many miles from her hometown. Finding it hard to adjust. She has three beautiful children who she dotes on. But, that doesn't stop a Mother dreaming of a better future does it. Her husband however makes life very difficult. Who is Sybil's best longstanding friend. They have know each other for many a year. She now lives far away in Alice Springs. She comes originally from Texas. Now living in Australia with no aims, no goals, and needs to make her life more meaningful. In each of these women's lives there is a hole to be filled, a need and a want. We experience how these women come together and support each other through some amazing times, some difficult times within their own families, and some 'eye opening' times. Sybil comes up with an idea. All the women have something in common, they love to read. Books. They love to read and fill they're days with joy from this. They form a book club, but not only that, they form a friendship and long lasting true bonds. I would like to thank Little Brown Books for sending me this delicious paperback to read. I would imagine life is hard in this area, and the challenges that the women face in this book and in actual life are enormous. The seasons of wet and dry, the isolation, the lack of the many entertainment opportunities we ta The words book club might have drawn me to The Inaugural Meeting of the Fairvale Ladies Book Club, and that part of it lived up to its promise, however it is the setting in the Northern Territories and the friendships and lives of the five women that kept me reading as well. I would imagine life is hard in this area, and the challenges that the women face in this book and in actual life are enormous. The seasons of wet and dry, the isolation, the lack of the many entertainment opportunities we take for granted. And this book is set in the 1970's and early 80's. Yet on the other hand there is a beauty in the landscape and I am sure something that draws people to this harsh environment. The five women were all interesting and I liked slowly getting to know them. Sybil - the matriarch is the one who starts up the book club. The book club helps to bring the women together and even if they have to have it over the radio because the weather is bad, it goes ahead. And they really do discuss the books and through them become involved more in each others lives. Sybil already has a great friend in Rita - from early working days. Kate her daughter-in-law is English and is facing into a place so different to where she grew up. Della is a stock person and hails from Texas, and she finds the northern territories grow on her all the time. Sallyanne really benefits from the friendships, she is a bright, intelligent, young woman in a marriage that is going south. I liked her penchant for the romance genre too! These women face into loss and grief, the hardships of the job, the pain of miscarriage, the difficulties of marriage and the absolute pain of racism. Through it all they support each other - walk with each other - and through it all make a life worth living. Set in the late 1970s and moving through to 1981, this book tells the story of a group of women who live in the harsh landscape of the Northern Territory. To try and help her youngest son’s English wife, Kate, settle in to life on Fairvale and make friends, Sybil starts a book club. Sybil invites her dear friend Rita, who is a nurse with the Flying Doctor Service, Sallyanne a young mother of three. Her neighbour, Felicity, suggests Della, a young Texan working on their property might also be int Set in the late 1970s and moving through to 1981, this book tells the story of a group of women who live in the harsh landscape of the Northern Territory. To try and help her youngest son’s English wife, Kate, settle in to life on Fairvale and make friends, Sybil starts a book club. Sybil invites her dear friend Rita, who is a nurse with the Flying Doctor Service, Sallyanne a young mother of three. Her neighbour, Felicity, suggests Della, a young Texan working on their property might also be interested. The women all come across as real. I liked getting to know the differing personalities and the issues each woman has. I loved the setting with its vibrant colours and could almost taste the red dust and the feel the isolation that happens with the wet season. I also like the way it gives a rundown of main events that happen in the world during the years mentioned. I bought this book after being somewhat dissatisfied with two previous reads. This one got me in from the start. I felt like I was right there with these women. I also liked the book choices that the women read and sometimes disagree on in their book club. The story covers a lot of family issues including prejudice, difficult family dynamics, divorce, and death, as well as romance, friendship and medical emergencies that are not easily dealt with in the outback. The Inaugural Meeting of the Fairvale Ladies Book Club is a novel by Australian author and publisher, Sophie Green. It may be twenty-six years but Sydney ex-nurse, Sybil Baxter hasn’t forgotten the culture shock and the sense of dislocation she felt when Joe Baxter first brought her to Fairvale Station near Katherine in the Northern Territory. And now her youngest son, Ben has brought his English bride, Kate to live here. To allay her some of this London girl’s loneliness, Sybil decides to gathe The Inaugural Meeting of the Fairvale Ladies Book Club is a novel by Australian author and publisher, Sophie Green. It may be twenty-six years but Sydney ex-nurse, Sybil Baxter hasn’t forgotten the culture shock and the sense of dislocation she felt when Joe Baxter first brought her to Fairvale Station near Katherine in the Northern Territory. And now her youngest son, Ben has brought his English bride, Kate to live here. To allay her some of this London girl’s loneliness, Sybil decides to gather together some women to form a book club, combining companionship with culture. The Inaugural Meeting of the Fairvale Ladies Book Club how a resourceful woman living on an isolated station in the Northern Territory was able to help her family and friends to cope with the isolation. Ben Baxter and his wife Katie was trying to become pregnant, and Sybil Baxter started to worry about how Katie was dealing with not falling pregnant and the isolations of Fairvale. So Sybil came up with the idea of setting up the Fairvale Ladies Book Club and involving women in the community and The Inaugural Meeting of the Fairvale Ladies Book Club how a resourceful woman living on an isolated station in the Northern Territory was able to help her family and friends to cope with the isolation. Ben Baxter and his wife Katie was trying to become pregnant, and Sybil Baxter started to worry about how Katie was dealing with not falling pregnant and the isolations of Fairvale. So Sybil came up with the idea of setting up the Fairvale Ladies Book Club and involving women in the community and her friend Della. The readers of The Inaugural Meeting of the Fairvale Ladies Book Club will follow the adventures of the ladies of the book club to see what happens to them. Wow, I love reading The Inaugural Meeting of the Fairvale Ladies Book Club. I am so impressed with Sophie Green thinking a way to help rural women cope with loneliness and depression by developing a monthly book club. I like Sophie Green writing style and her portrayal of her characters. I like the way Sophie Green at the beginning of each part highlighted what was going on in that year. By doing this Sophie Green allow her readers to feel that they are part of the story. Readers of The Inaugural Meeting of the Fairvale Ladies Book Club will learn about the Royal Flying Doctors Services and the important role they have for rural communities. Also, readers of The Inaugural Meeting of the Fairvale Ladies Book Club will understand the value of the CWA in rural communities. Reading The Inaugural Meeting of the Fairvale Ladies Book Club, you will start to think about the problems women have when they move into isolated rural communities in Australia. This was an enjoyable read set mostly in the Northern Territory at the end of the 1970’s/early 1980’s. The descriptions of life in the Northern Territory were wonderful - of how life revolves around “the wet” and “the dry”, and the vibrant colours with new life. Although I’ve never been up that way, it is described just how I imagine it! And such a hard life - especially at that time, since there was no internet and even phones weren’t commonplace! I really enjoyed getting caught up in the lives o This was an enjoyable read set mostly in the Northern Territory at the end of the 1970’s/early 1980’s. I really enjoyed getting caught up in the lives of the women of the book club, although there was less book club discussion than I’d been anticipating. There were some very sad or difficult events in the lives of these women at times - there were even a couple of times when I felt a bit emotional - I didn’t cry, and while I wasn’t actually heart-broken, I think I might have chipped a few bits off my heart! Cliched characters & plot. An OK read. I really liked this book. There was a varied collection of ladies and a few men of different ages who all had interesting stories and situations. The timeline was Australia 1978-1981 and what I also liked was the page of key historic events of each year on a page as it went into a new year of the story. Sybil is The wife of Joe. They own Fairvale. They have a happy marriage and two sons. Both are grown up (Lachie & Ben) Ben is the younger son and is married to English girl Kate. Lachie is th I really liked this book. There was a varied collection of ladies and a few men of different ages who all had interesting stories and situations. The timeline was Australia 1978-1981 and what I also liked was the page of key historic events of each year on a page as it went into a new year of the story. Sybil is The wife of Joe. They own Fairvale. They have a happy marriage and two sons. Both are grown up (Lachie & Ben) Ben is the younger son and is married to English girl Kate. Lachie is the son who took off the year before and they haven't seen him for dust. Lachie and Ben are like chalk and cheese. Ben is the strong and dependable one where as Lachie is a horrible individual and it takes a good portion of the book for his mother to realise that things are better without him although it is totally understandable that Sybil tries to not give up on him. Sybil decides to create a book club. The area isn't exactly a hive of social activity and she wants to do something to bring people together and also help her daughter-in-law make friends. The other people that join this book club is a female stockwoman from another station called Della. She is from America and around Kate's age. Then there is Sybil's best friend Rita who works for the flying doctor service. Rita has never married although she has had her share of "romance" Sallyanne is just a lonely woman in an abusive marriage with three young children to raise. It's her only real outlet from motherhood and carefully treading around her drunken husband. Through books and spending time with each other the women bond into a close sisterhood. Each having their own unique set of situations. There is some tragedy and some heartbreak through the years with these ladies. Some is resolved and some is a hope for the future but they always have each others backs through whatever life throws at them. I've made some new friends - Sybil, Kate, Rita, Della and Sallyanne - and I'd love to go to their next book club! A gem, I loved it. I am always interested in reading books which are set in Australia, and this one was a beauty! Set in the Northern Territory (a place I have never been, even though I am Australian myself) in 1978, life was tough for the women of the outback who find themselves quite isolated. Sybil, a no-nonsense matriarch of a large cattle station, has the idea of forming a book club for the various ladies she meets, as well as for herself and her English daughter-in-law. This novel is about far more than books I am always interested in reading books which are set in Australia, and this one was a beauty! Set in the Northern Territory (a place I have never been, even though I am Australian myself) in 1978, life was tough for the women of the outback who find themselves quite isolated. Sybil, a no-nonsense matriarch of a large cattle station, has the idea of forming a book club for the various ladies she meets, as well as for herself and her English daughter-in-law. This novel is about far more than books, however. It is about social issues, about how technology was not yet available as it is now for the people in outback communities, about love and the strength that women have when things get tough and it is very definitely about community and what it means to be a family, even if you aren't related by blood. It really was a beautiful book to read and I am still thinking about the characters. There was a lot of depth to this book. I thoroughly enjoyed this book from start to finish a beautifully written story about five woman who come together in the outback for a book club. Sybil Baxter is the matriarch of Fairvale Station she came here as a young bride many years ago and is very happy with her husband Joe they have two sons and a daughter in law of course life is never perfect but is what you make of it and Sybil worries about her young English daughter in law Kate and hence the book club is formed never thinking how mu I thoroughly enjoyed this book from start to finish a beautifully written story about five woman who come together in the outback for a book club. Sybil Baxter is the matriarch of Fairvale Station she came here as a young bride many years ago and is very happy with her husband Joe they have two sons and a daughter in law of course life is never perfect but is what you make of it and Sybil worries about her young English daughter in law Kate and hence the book club is formed never thinking how much it would help all five of them. Sybil invites her best friend Rita who is living in Alice Springs working with the flying Doctors then daughter in law Kate and also Della a young woman from Texas working on the neighbouring station Ghost River and Sallyanne a young mother from the town of Katherine to join her in being the first members of the book club, this starts strong friendships between all five and they discuss more than books over their three years, of course they cannot meet as often as they would like because of the weather there is no travelling in the wet season. I loved getting to know these woman and the people that are in their lives the strength that they show through some very tough times the outback can be a hard place to live and these woman rock. There are men in their lives that work hard and show their love and there are some men that just don’t. I felt like I was there with these Ladies as they discussed the books their first book is one that I loved and read in one sitting, and had me smiling, but above all I loved how they helped each other through thick and thin. This book is set between 1978 and 1981 I married in 1977 so there was a lot of familiar events and incidents that I knew about and MS Green made me feel close to the characters even though I have never visited the outback it is a place I would love to go to. The book club was a fabulous idea, I am sure that even though the stations have lots of workers the woman could often feel lonely. I don’t want to give too much away just the this is a fabulous read with a cast of amazing characters that I highly recommend, it is moving and shows so much emotion there were tears and smiles there is joy and yes there is heartache but that is to be expected in life and MS Green has done it so well. There is an ending that will leave you smiling seeing characters get their HEA and leave you with hope for others. I loved this one thank you it is one that will stay with me for a long time to come. In addition to having a very long title, The Inaugural Meeting of the Fairvale Ladies Book Club by Sophie Green has something for everyone. Well, when I say everyone, I’m assuming most readers will be female. Just cos. But young / old; married / single; city dweller / country gal, you’ll most certainly find yourself identifying with one or more of the five women featured in this novel as they’re all relatable, likeable and very very real. I hadn’t read the backcover blurb so it took me a while to realise this was set in the past and there were reminders of past events scattered throughout (Skylab crashing to earth, Ronald Reagan becoming President, Diana and Charles getting married) – annual milestones Green included between ‘years’. The book’s very much centred around the concept of ‘family’ – either the one we’re born into or ones we make ourselves. And it touches on relationships, love, loss and grief and we’re reminded of how the world has changed and the impacts that technology and access to information have had on our daily lives, but also on our beliefs and societal norms. It’s obvious Green loves the Northern Territory and the land: there’s a real appreciation for the beauty AND the harsh reality of the vast emptiness, of the impacts of distance and inaccessibility and the mighty power of mother nature. I know it’s a cliche, but it needs to be said…. the book will certainly appeal to bookclubs. But Green kindly adds notes at the end about the books the women have read and referenced (and there are some great Aussie literary icons); and includes bookclub conversation starters about the book. About a bookclub. I received a copy to review from the publisher, and it was beautifully written. I found it intriguing and loved that each characters voice sang out individually in the chapters told from their perspectives. Telling the story through the eyes of five people worked well too. A longer review will appear on my blog on the release date next month. I have absolutely adored reading The Inaugural Meeting of the Fairvale Ladies Book Club. True to the era and the location in which it is set, this novel is a real slice of rural social history, the spirit of Australian outback station life converging with the reality of living so remotely. With a cast of likable characters, your time at Fairvale Station will pass all too quickly, despite the hefty page count of the novel. 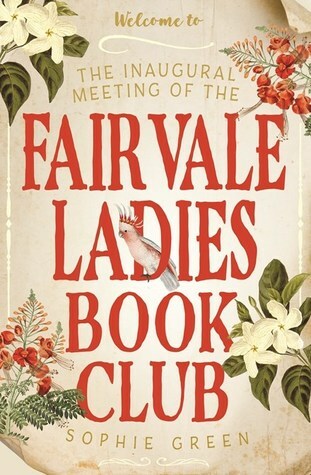 While I would have loved more of the book club to take centre stage through I have absolutely adored reading The Inaugural Meeting of the Fairvale Ladies Book Club. True to the era and the location in which it is set, this novel is a real slice of rural social history, the spirit of Australian outback station life converging with the reality of living so remotely. With a cast of likable characters, your time at Fairvale Station will pass all too quickly, despite the hefty page count of the novel. While I would have loved more of the book club to take centre stage throughout – particularly since this was the whole premise of the novel – this is the only thing I can fault. The story, the characters, the seasonal atmosphere, the remote location, the history; it was all so wonderfully threaded together, with not a single dull moment at all. The addition of the timeline of notable world events at the beginning of each new year/section added a lovely touch of nostalgia. I also appreciated the additional author notes at the end about each of the novels read by the ladies of Fairvale. It’s all of these little extras that often make a novel go from being a great read to a standout pick of the year. "There were key moments in every life when decisions had to be made in a second even though they had the potential to irrevocably alter everything that came after them. Sybil had experienced them before. She remembered how they felt: how the world became quiet and narrow. How each breath seemed momentous. Time changed form and sometimes it never changed back." I love the way this story showcases the bonds of friendship, reinforcing the importance of having and maintaining relationships despite distance and time between visits. There is one terrific scene where the ladies have their book club meeting via two-way radio – just marvellous! While it would be easy to romanticise station life, Sophie Green approaches it with more authenticity. The highs and the lows, the burdens as well as the freedoms, with the end result being a story that has all the hallmarks of a future Australian classic. "Fairvale was a home and a workplace; it was also, for her, a living thing. It changed shape as people came and went, and the seasons turned. If she’d been asked to say where its heart was, where its brain resided, she could give answers but they would change too." I really enjoyed this novel, reading it voraciously over the weekend and I’m keen to discuss it with my own book club, which fortunately, can meet face to face and far more often than the Fairvale Ladies Book Club! Wat een prachtig boek! Ik heb meer dan eens een traantje gelaten bij dit oprechte verhaal. In De leesclub aan het einde van de wereld beginnen vijf vrouwen in de Australische outback een leesclub. Twee keer per jaar overbruggen ze de enorme afstanden die hun scheiden om te praten over boeken en het leven. Langzaam worden de vrouwen vriendinnen, misschien zelfs familie. Ik had niet verwacht dat dit boek me zo zou raken, maar ik leefde zo ontzettend mee met de personages. En ik herkende ook de man Wat een prachtig boek! Ik heb meer dan eens een traantje gelaten bij dit oprechte verhaal. In De leesclub aan het einde van de wereld beginnen vijf vrouwen in de Australische outback een leesclub. Twee keer per jaar overbruggen ze de enorme afstanden die hun scheiden om te praten over boeken en het leven. Langzaam worden de vrouwen vriendinnen, misschien zelfs familie. Ik had niet verwacht dat dit boek me zo zou raken, maar ik leefde zo ontzettend mee met de personages. En ik herkende ook de manier waarop ze voor zichzelf een surrogaat familie creëren, bijvoorbeeld omdat familie ver weg woont. Prachtig. The title of this book is a little misleading (as in, I was expecting the ending to be the inaugural meeting). We not only have the inaugural meeting early on, but many others through the course of the novel. The rest of the book is, of course, what happens between meetings to the five book club members. Unfortunately, the characterisation of the five women isn’t the strongest; they could all be interchangeable. Their plots too, are pretty cliched and soap opera-ish. The book is set in the North The title of this book is a little misleading (as in, I was expecting the ending to be the inaugural meeting). We not only have the inaugural meeting early on, but many others through the course of the novel. The rest of the book is, of course, what happens between meetings to the five book club members. The book is set in the Northern Territory and I thought this would be a great opportunity for Green to offer the reader some detailed descriptive passages of the unique flora and fauna found there, but… Green’s writing is just too basic and I was seriously disappointed in this arena. I was also looking forward to something special with the book due to the time setting (the late 70s, early 80s). Other than the odd reference to news and current affairs of the time, such as Charles and Diana’s wedding and the death of Azaria Chamberlain, it could have been set in any time. Some of the time’s racism and sexism is touched upon, but I wouldn’t say there’s any great heartache portrayed with these problems, or earth shattering revelations that reflect on our current social or political issues. The books the club read are all well known but they aren’t studied or discussed in any great depth. They might make for interesting recommendations for a non-Aussie reader, but as an Australian I knew them all and therefore, I wasn't inspired to add anything to my TBR list. You might be able to tell, I was really disappointed in this book. I didn’t care about any of the characters or their (apparent) dilemmas. Green’s writing style offered no chemistry when it came to the romantic relationships, no heartbreak for the sad plotlines and no real surprises overall. I was expecting some lovely feminist literature and instead I feel like I've just read a really bad novelisation of an episode of the Flying Doctors. I picked this book up because it was about a group of Aussie ladies, in the Outback, starting a book club. I wanted to see how they started it, how they managed to get together but also what sort of books they liked to read. I fell in love with a group of women and the place that they call home - Fairvale. This is a little gem of Australian fiction that really gives you a sense of our country during the time period it is set, as well as opening our eyes to some classic Australian fiction, all whi I picked this book up because it was about a group of Aussie ladies, in the Outback, starting a book club. I wanted to see how they started it, how they managed to get together but also what sort of books they liked to read. I fell in love with a group of women and the place that they call home - Fairvale. This is a little gem of Australian fiction that really gives you a sense of our country during the time period it is set, as well as opening our eyes to some classic Australian fiction, all whilst delving into the lives of our 5 main characters. It made me want to go back and re-read the Thorn Birds again. We have a group of strong women, held together by Sybil who started the group as a means to helping her isolated daughter-in-law find some friends her own age. They developed into a family unit who stand by one another when things get tough. Based on a property in the middle of nowhere in the Northern Territory in the late 1970s, this book centres around those that live on Fairvale Station and their friends. It is a brutal climate, an isolating location, and hard work to live in Fairvale so book club is the way that Sybil tries to welcome her new English daughter-in-law Kate to this strange way of life and introduce her to some other women in the "area". It is not often I come across books set in outback NT, let alone in the late 70s, Based on a property in the middle of nowhere in the Northern Territory in the late 1970s, this book centres around those that live on Fairvale Station and their friends. It is not often I come across books set in outback NT, let alone in the late 70s, so the setting alone made this really intriguing. The descriptions of the wet and dry seasons, and the vastness of the space really drew me in. The characters are also very well crafted, each with their own unique voice and wishes for the future. This is a book I would recommend to anyone that enjoys a nice light read about friends and family. A good book to read on holiday. The number of cliches grated on me but it could have also been the mood I was in. The story seemed to wander on down an indiscernible path at times. It tried hard to be that book that gives the reader a look into the lives of different characters but to me they were just shallow, saccharine sweet versions of real women. It was a joy to discover this book only months after I moved away from the Northern Territory. Sophie brought the unique Northern Territory outback setting to life in a vivid and realistic manner. I enjoyed the different voices of the women, empathised with their isolation and felt their friendships grow. A book about a book club - what more could a book lover ask for? The Fairvale Ladies Book Club is a fantastic read which transported me to the Northern Territory in the late 1970s, complete with all its harshness and the problems of the day. The story covers the lives of five different women who all come together for the book club, all from different walks of life and all with different problems, but ones that most of us can relate to at some time or other. It's full of drama and struggles, set against the background of a land of red dirt and one that's either The Fairvale Ladies Book Club is a fantastic read which transported me to the Northern Territory in the late 1970s, complete with all its harshness and the problems of the day. The story covers the lives of five different women who all come together for the book club, all from different walks of life and all with different problems, but ones that most of us can relate to at some time or other. It's full of drama and struggles, set against the background of a land of red dirt and one that's either very wet or very dry. Well I absolutely loved every page of The Inaugural Meeting of the Fairvale Ladies Book Club. I have never read a Sophie Green book before but I was impressed how well she tricked me! I thought I was just getting a book about a bunch of women coming together to talk about books – not a book that would transport me back to the early 70’s in a rural setting in the Northern Territory where women were dealing with loneliness, depression, drought and flood! I loved each and every character that came Well I absolutely loved every page of The Inaugural Meeting of the Fairvale Ladies Book Club. I have never read a Sophie Green book before but I was impressed how well she tricked me! I thought I was just getting a book about a bunch of women coming together to talk about books – not a book that would transport me back to the early 70’s in a rural setting in the Northern Territory where women were dealing with loneliness, depression, drought and flood! I loved each and every character that came together first in the book club, and then great, resourceful friends that helped each other through so many things. This was a fantastic read, beautiful outback Australian setting and wonderful characters. Highly recommend….